Lynn Pauley is an artist and an illustrator. She earned her BFA from Syracuse University and her MFA from the School of Visual Arts. 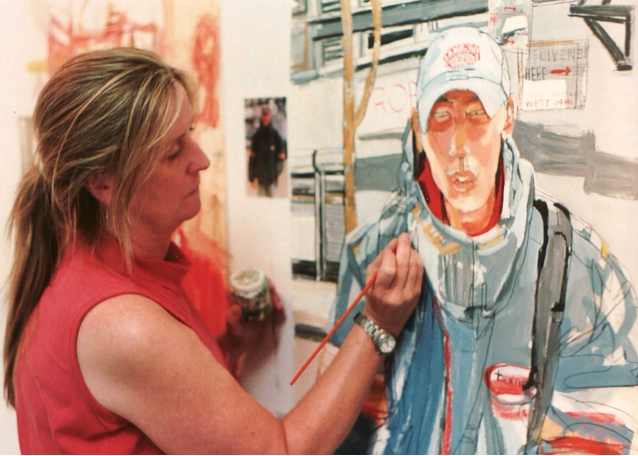 Trained as a visual reporter, her words and pictures have chronicled the events of 9/11, the bombing of the Murrah Federal Building in Oklahoma City and the Masters Tournament in Augusta, Georgia. Her expressive signature line drawings and lush acrylic paintings have appeared in the The New York Times, The New Yorker, and Sports Illustrated as well as illustrating book covers for Farrar Straus Giroux and the University of Georgia Press and a children’s book for Henry Holt. Corporate commissions include the SPOTCO Broadway poster campaign for Superior Donuts, The ‘new look and feel’ of the NY Jets and 4 original multi-image wraparound murals for the Robin Hood Library Initiative. She was the 2016 Northeastern Biennial Exhibition Painting prize winner. Her landscape, sign and figurative paintings and collages are frequently exhibited at a variety of locations. Lynn Pauley has taught art and illustration on the college level both here and abroad since 1989. She holds an Art Education degree from Parsons School of Design. She currently teaches at the Delaware College of Art and Design in Wilmington, DE.